It looks like Melvin Mora has officially moved on from the Orioles. Today, he signed a one-year deal with the Colorado Rockies. From the Rockies MLB Website: The Rockies agreed a one-year, $1.275 million deal with infielder Melvin Mora on Sunday, pending the results of a physical, Major League sources told MLB.com. Signing Mora, a two-time All-Star who turns 38 on Tuesday, means the Rockies have the right-handed-hitting utility player they've been seeking this winter. They've also signed left-handed-hitting Jason Giambi. Mora, a career .278 hitter who hit .260 with eight home runs and 48 RBIs for the Orioles last season, appeared in 124 games at third in 2009, giving the team an experienced third baseman to step in, should Ian Stewart be injured or need to be spelled against left-handed pitching. Mora, who has also seen time at shortstop, can also spell Troy Tulowitzki, has extensive experience in center field, and has worked at second base. Mora had to be one of the best players to have worn a Baltimore uniform in a generation. Considering where Melvin started, he became one hell of a third baseman and formidable hitters in the Oriole lineup. Snow is falling once again in Charm City and as I stare at the flakes falling, fluttering, slowly down to the pavement below I sit a ponder. Many things wander and weave through my mind; there really isn't much else to do on a day like this. So I am sitting on the couch, with "The Sandlot" playing on the television behind me dreaming of baseball and what the Spring has in store. The Orioles of course face a daunting task of playing the toughest division in baseball, blah blah blah, we have heard that all before and there is no use into going into all that again. Various projections of course have the Yankees challenging for 100+ wins and the Red Sox close behind them. Surprisingly the Orioles are not the doormats in a lot of these projections, more than a could have us winning between 75-83 games. So where do I see the Orioles landing in October at this admittedly very early stage of things? Glad you asked internet, lets take a look at the winter's acquisitions. Kevin Millwood: Arguably the most important acquisition of the winter. I bet no one ever expected to see "most important" and "Kevin Millwood" in the same statement, but in this case it is true. Andy's first real move of the winter sent struggling relief pitcher/ closer Chris Ray to the Rangers for the veteran starter. By default, Millwood becomes the Orioles "ace" but we all know that is not the case. Critics of MacPhail and the move in general will derisively call Millwood our "ace", but even they know that they are using the terminology as an excuse to be needlessly negative. Millwood was brought in here to be one thing and one thing only, a source of stability. Millwood does not need to be a number one starter; don't let his likely opening day start fool you. He is here to take pressure off of the real source of strength in the rotation coming from Bergesen and, hopefully, Matusz and Tillman. Millwood's 198 innings of sub-4.00 ball would be a welcome force in what reckons to be a volatile young rotation. On top of that Millwood did a very good job in a home stadium that has slightly fewer things flying out of it than the Southwest hub in Dallas. The 2009 Orioles gave up a league-worst 218 home runs so the team needs all the help it can get in that department and Millwood will offer that. Garrett Atkins: Atkins was signed as a free agent to a one-year deal and seems destined to man the hot-corner until Josh Bell matured a little more in the minors. But, surprisingly, Atkins will move across the diamond to first base. Atkins had a monster season in Colorado - three years ago - and since has fallen on hard times. His last three seasons have been marked by consistent decline and what seems to be a complete loss of any consistency at the plate. The Orioles hope that Terry Crowley can straighten Atkins out and he can be a viable option at first and a solid bat in the lineup. Personally, color me "meh" about this signing. Atkins is he stop-gappiest of stop-gaps out there. At third he made sense, but at first I guess the Orioles are hoping Brandon Snyder comes a long or maybe Micahel Aubrey proves to be more than organizational filler. Atkins is a candidate for a rebound year, anything is possible after all and I doubt anyone just "forgets" how to swing a bat. I expect Crowley to help Atkins, and i expect a little bit of a rebound but I doubt that he is anything better than league average at best. The Orioles hole at first base is very much a problem and has been for awhile, Atkins is not the answer but he should provide a better option than another year of Huff or someone of that ilk. As we all know, the Orioles' new Spring Training home will be in Sarasota this season (at Ed Smith Stadium as well as the Buck O'Neil Stadium complex) and for the upcoming future; therefore, the team is looking to spruce up and renovate the property. However, a nasty little thing such as politics are getting in the way, and the stadium development plan could be possibly held up. Meanwhile, it looks like the stadium is already being spruced up for the arrival of the Baltimore Orioles for Spring Training. However, as noted by Greg Bader - Communications Director for the Baltimore Orioles - the interest in that part of Florida for Spring Training baseball is very high and ticket sales seem to be doing well; plus, that the whole complex will be updated. One of the biggest changes will be the very feel of the stadium. Instead of the one-story Ed Smith where the behind-home-plate entrance led into a wall, the new two-story facade features a trio of arches with a direct view onto the field. Passing through the arches, visitors will suddenly have a full view of the ball field, says Sarasota architect Gary Hoyt, who is collaborating with Washington, D.C.-based architect David Schwarz on the project. "It's a welcoming shape," Hoyt said. And different from Ed Smith, where "you're either in the stadium or out." Keith Law came out with his 100 top prospects list on ESPN's website yesterday and the good news is that there are a few Orioles on the list. The names listed are Brian Matusz (#11), Zach Britton (#25), Josh Bell (#61) and Jake Arrieta (#90). It's an interesting list that he's compiled. 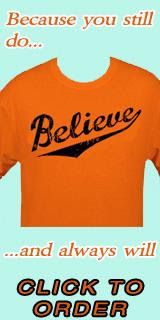 You have to be part of ESPN's Insider to view it; however, I copied the salient items for the Baltimore Orioles. His thoughts on Matusz: Matusz barely qualifies for this list, falling just 5.1 innings short of the 50-inning cutoff (teammate Chris Tillman is over the line and thus no longer a rookie in 2010), but the added experience might give him a leg up on the AL Rookie of the Year race in 2010. Matusz is a true four-pitch pitcher, but unlike most pitchers of that breed, all four of his pitches project as above-average or better. Matusz sits in the low 90s and will touch 94 with his fastball, although its lack of movement limits its potential as an out pitch and I expect Matusz to end up using his fastball less often than a standard pitcher with that velocity. His best secondary pitch is an 11-5 curveball with tight rotation and good depth, and he has excellent arm speed on his lively changeup. His command has improved steadily since his sophomore year in college, and -- as predicted here last year -- he raced through the minors on the strength of his off-speed pitches. He's not the prototypical No. 1 starter with a big fastball and an easy delivery, but his ability to miss left- and right-handed bats in different ways gives him a chance to lead a staff, regardless. His thoughts on Britton: Britton is a true sinker/slider pitcher with enough velocity to work as a starter and a potential out pitch in the slider to miss bats when he's not getting ground balls. His sinker has solid-average velocity with legitimate plus sink, and he'll flash a four-seamer up to 94. His slider -- although not as consistent -- flashes plus, and he's willing and able to backfoot it to right-handed hitters, then throwing the sinker away to get a weak grounder or just a swing and miss. His changeup improved over the course of the season to the point that it's an average pitch or better, eliminating a major concern for sinker/slider guys -- a typical weakness against opposite-side hitters. Britton's arm works well with high hand separation and a short arm path, and he's a good athlete with some room to fill out up top. His control remains below-average and his command of all pitches and feel for the slider need to improve, as well, but he would slot in very nicely as a No. 2 starter behind Brian Matusz, or as an outstanding No. 3 behind Matusz and Chris Tillman. For fans of the Orioles, this time of the year serves as the most exciting. Even though there have been no games played as of yet, hope truly springs eternal when you talk about the potential opportunities out there for Orioles. Now, everything is hypothetical and make for good chatter, but at this time of year, it's all just talk. With the re-introduction of Miguel Tejada yesterday, it looks like the Orioles are certainly done with improving the offense and will certainly focus on the pitching -- especially a left handed arm (more likely a reliever). Again, I guess the question most are asking is -- have the Orioles improved? I'll say this -- we all should be happy what the Orioles have done in terms of their acquistions so far, but the team does need more (but, in reality, one can only do so much). With the exception of Gonzalez -- who has proven to be a decent releiver, at least in the National League -- the organization has Tejada, Garrett Atkins and Kevin Millwood for a season (if not less). After the 2010 season, more than likely, there may be even more turnover. Right now, it looks the team is hoping to win more than they have done previously; however, the larger plan in place is to give the talent in the minors enough time to develop and improve before being promoted to the majors. Obviously, since the Orioles cannot go out and purchase every free agent out there like the Red Sox or Yankees, their plan is a prudent one. Build from within and develop your own players. Plus, hope for the best. While the pitching has been upgraded - somewhat - I still think the team needs to acquire another starter. Right now, it looks like the potential rotation out of camp will consist of Kevin Milwood, Jeremy Guthrie, Brad Bergesen, Brian Matusz and possibly Chris Tillman. However, if Tillman fails, who picks up the void? Hernandez, Berken, or perhaps another dark horse candidate? Do the Orioles go after someone else? Melvin Mora's tenure in Baltimore came to end in Baltimore after eight season in October; however, it looks like he may have a new home soon enough. He lives in the area -- I think -- for now, but he may have a new team to play for in the Colorado Mountains. For now, Mora's still on the market, but the Rockies have an interest in him. From the Denver Post: The Rockies’ front office met early this offseason and identified the players it would like in a bench role. The executives calculated that a handful of players could fall into their laps if they exercised patience. One of those is still sitting on the market — Melvin Mora. He likes the Rockies. Wants to play on a contender. There could be a match here. Melvin has long been on the Rockies’ radar, but makes more sense now that the Rockies have limited some of their bench flexibility by bringing back Jason Giambi. “Melvin likes it there. He’s definitely interested,” said agent Eric Goldschmidt, who has roughly five teams interested in his client. The deal has been in the works for a while, but it looks like Mark Hendrickson will be back in Baltimore on a one-year deal. He will be the second lefty in Baltimore's bullpen aside from Mike Gonzalez. In a long awaited move, the 35-year left-hander agreed to a one-year, $1.2 million deal with a $1.2 million team option for 2011 that includes a $200,000 buyout, according to an industry source. The signing is pending a physical, which has not yet been scheduled. Hendrickson, who served various roles for the Orioles last year but is targeted for relief in 2010, would earn an additional $100,000 each year in escalating bonuses for starts made ($25,000 each for his 10th start, 12th start, 14th start and 16th start). He earned $1.5 million in 2009, when he went 6-5 with a 4.37 ERA in 53 games (11 starts). The year-round resident of nearby York, Pa., made it no secret that he wanted to remain with the Orioles, and club president of baseball operations Andy MacPhail echoed the interest but said that he expected to fill out other parts of his roster before turning his attention to the 6-foot-9 veteran. He didn't do much as a starter, but in relief, Hendrickson might have been the best pitcher in the bullpen. Good to see him back. It looks like Miguel Tejada will be number nine for the Orioles this season, rather than requesting his old one from Adam Jones. Roch also has more thoughts and words from Tejada from the activies on Tuesday. The Baltimore Sun has more coverage of the Miguel Tejada press conference from yesterday. Meanwhile, Peter Schmuck looks at what the signing means for the team realistically. Steve Melewski also gets some input from Tejada on Tuesday. He also looks at Luke Scott and comments about him from Andy MacPhail at Fanfest. ESPN's Keith Law has his rankings the 30 organizational farm systems in MLB, and he's got the Orioles ranked as number six. If you're curious, Texas is ranked number one while the White Sox are last. Scott Hoffman of Orioles Hangout has a report from the Tejada press conference. The Orioles have made an offer to reliever Will Ohman, while they are *still* trying to ink a deal with Mark Hendrickson. Also could Dennis Sarfate be designated for assisgnment (thanks to MLB Trade Rumors). Note: Sarfate was designated for assisgnment. Check out the 'Birds on a Wire" podcast at the Baltimore Sports Report. Stan Charles of Pressbox has his thoughts on the 'game-day' ticket price increase. We are probably about three weeks away from pitchers and catchers reporting to camp, and a name that keeps popping up in discussions about the pitching is Erik Bedard. Based on some of the discussions during the fan forums on Saturday – especially with Andy MacPhail/Dave Trembley along with the press – the former Oriole still is on the team's radar. However, listening to 105.7 this morning on my way into work, and also what I got from FanFest, no one really knows if Bedard is ready to come back or if he’s fully healthy, but he should be able to pitch in the early part of 2010. Then again, he’s not said much – if anything all – nor, have I heard his name elsewhere when it comes to rumors. Well, I can understand the aversion to Bedard -- he seems to be a surly guy, always seemed to be hurt, a lot of people in the media sound like they don’t care for him, and didn't seem to be willing to go deep into games. However, he can pitch – when motivated or healthy. As you all probably know, the Baltimore Orioles held a press conference at 3pm today to re-introduce Miguel Tejada to Birdland. If you were at work -- like I was -- the press conference was online at orioles.com, mlb.com and wjz.com. From what I saw via the Internet, both Tejada and MacPhail said all the right things and looked to be on the same page. I was happy to hear that Tejada was happy to have been invited back to Baltimore, and much like all of us fans, he wants to be part of a winner. The man said he's willing to work at becoming a third baseman and obviously help out the Orioles. From the Sports Network: The two sides came to terms on a one-year contract last week, pending a physical for Tejada, who will be plugged in at the hot corner in 2010 for the first time in his career after 13 seasons at shortstop. Tejada said while he knows it's a different position, he was open to playing at either third or short coming into the offseason. "It's not going to be an easy thing to do, but I'll have a lot of time to work with the coaches," Tejada said. The 35-year-old gets to make the transition with his former club, as he returns to Baltimore after spending the last two seasons in Houston. He played for the Orioles from 2004-07 before being traded to the Astros for five players, including current Baltimore designated hitter Luke Scott. Tejada said Tuesday he followed the Orioles while he was with Houston, and is happy to be back in Baltimore, where he can easily transition into familiar surroundings. Moreover, Tejada said it's a chance for him to be on a winning Orioles team, as they were never above .500 in his first stint. "It's not about me, it's about everybody," Tejada said. "Now they have pitching, outfielding, young talent. They don't have to do too much to be a winner here." Obviously, he's only going to be an Oriole for a year -- or even just part of the season -- unless another plan unfolds. However, let's hope his words today can turn into action over the 2010 season. Dave Cameron over at Fangraphs chimed in on the Orioles' winter today; he is not impressed. There’s just very little upside in any of these deals. Even in a best case scenario, Tejada and Millwood continue to be above average players, make the team good enough to fight the Rays for third place in the AL East, and then file for free agency again next year. Or, I guess, you could hope to trade them at the deadline for a prospect if they’re playing well, but then that raises the question of why the team didn’t just take the $15 million they gave those two and plow it into the draft and international free agents in the first place. This just isn’t the off-season that I thought the Orioles had in them. This is a safe, low risk, low upside winter that doesn’t really change the fate of the franchise much at all. They got a little bit better for next year, but lost an opportunity to really help the 2011/2012 teams that could actually be quite good. I brought this up, not to bury him; he makes good points. However, I do disagree. While the Orioles offseason has not been the headline-grabbing juggernaut that some thought it might be I feel the Orioles offseason has been fine. I think the moves we made are fine complementary moves. The key word there is complementary. These moves are made to compliment the development of our younger players, something Mr. Cameron virtually ignores in his text. Maybe his projection don't show him a vastly different team from last year. But he doesn't really go into all of that. He is right in the consideration that these moves alone will have a negligible effect on the 2010, I don't think anyone can deny that. but I fail to see how Adrian Beltre was a lock to do that much better. I have said it before and I will say it here one more time: Success in 2010 is not tied to any one or, in this case, group of moves it will pretty much rely on the progression of the young players on this roster. It looks like Anita Marks is done with MASN and 105.7 FM. I first saw this on DCRTV and then on MASN. Anita also spoke with Jim Williams from the Washington Examiner and spoke with class about Baltimore along with it's sports fans. It looks like Anita and CBS Radio -- who employed her -- could not come to agreement on a new contract. Too bad, as I think her show with Scott Garceau made for some interesting banter at times. I know a lot of people derided Anita for always talking about her Miami ties and lack of Baltimore Sports knowledge at times -- especially when it came to the Orioles; however, she was rarely ever boring and always shared her opinion emphatically. Just here watching some of the NFC Championship football game and I wanted to get a greater perspective as to what the various blogs and websites are saying about the Tejada deal. I'm really quite amazed as to what I found at least in the hour I spent searching. It seems that the vast majority of Baltimore blogs want Tejada on the team; meanwhile, most of the Astros blogs are actually kind of glad he's gone. The Houston blogs have really nothing against Tejada, but a few wanted to see some prospects play in the big leagues rather than see him take a roster spot. Jeff Zrebiec of the Baltimore Sun has a piece on Tejada's transition to third base. Peter Schmuck likes the Tejada signing and it's a worthwhile gamble. Spencer Fordin has a piece on Tejada too. Steve Meleweski gives his thoughts on the Tejada deal. Jeremy Trucker of the Baltimore Examiner gives his thoughts on the big deal yesterday. Both Rex Snider & Drew Forrester from WNST do not like the Tejada signing. Mike Miller from Orioles Hangout not looks at the Tejada deal, but also chats with several Orioles during the Fan Fest festivities. Chip Bailey of FanBlogs (HOU - Houston Chronicle) mentions the Tejada Deal briefly. MyFox of Houston mentions that Tejada did want to return to the Astros. The Baltimore Sports Report has their thoughts on the Tejada deal. Chris from Baltimore Sports and Life gives his analysis of the Tejada deal. Charm City Sports Talk thinks that all Orioles fans should like the Tejada signing. The Oriole Report gives a fairly good analysis of the Tejada signing and what it means for the team. Unless you’ve been under a rock or out of the country for the past 24 hours, most know by now that the Orioles have re-signed Miguel Tejada to a one-year, $6 million deal with incentives. Obviously, since the Orioles have Cesar Izturis at shortstop, Miguel Tejada will more than likely play third base. As most remember, when he was with in Baltimore during his first stint, he objected to a position change and considered himself to be a viable major league shortstop; however, during the past few years with the Astros, his range – according to most scouts – had slipped. Amazingly, he was still available into late January – a shocker to me; however, the trend over the past few years (especially with the decrease of steroid use in the game), teams are avoiding older players in favor of younger ones. That being said, the Orioles had a need, Tejada needed a job and both sides came to an agreement. It will be interesting to see how Tejada does at third, considering he’s been a major league shortstop for his entire career. I know he played third at the World Baseball Classic in 2009, but never for an extended period of time. The good thing with Tejada is the the bat is still there. Although he’s not the same player that he was when he first signed with Baltimore, he did hit .313 last year with 14 homers and 46 doubles. 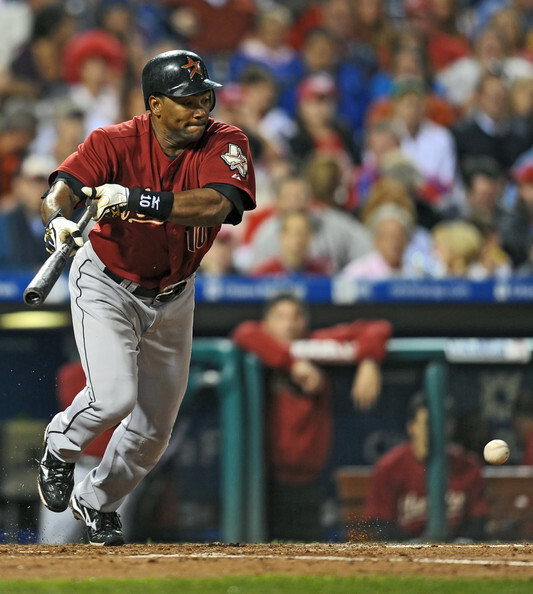 Then again, keep in mind he played half his games in Houston’s Minute Maid Park – a hitter’s haven. His numbers at the plate have dipped in the past few years, but he’s been durable and can produce at the plate. First off, fanfest was hugely entertaining and successful. According to the Orioles over 12,000 people filed into the Baltimore Convention Center downtown to grab some swag and talk shop with other O's fans. After the morning Q+A session with Andy MacPhail and Dave Trembley, a wonderful complete recap can be seen right here, my friends and I pondered what to do next. Barry got in line to grab a Nick Markakis signature and the rest of us aided our friend Matt's quest for as many O's car magnets as possible. Esskay booth - two magnets; Chik Fil A booth - five more magnets; Back up-stairs at the entrance - five more magnets. More on this later. Fanfest is always sort of a nomadic thing for me, I prefer to wander around and find adventure as it comes (wandering around netted us four more magnets). After buying a great 1960 score card (Senators v Orioles, Orioles won) and grabbing some free stuff from the free stuff line ('09 Orioles yearbook and size small Ryan Freel shirts, HOLY CRAP! But surprisingly no magents) We decided to forgo the high priced concessions and trek across the street to the Pratt St Ale House. A very nice place, a little core formal than Pickles or Sliders, but still a comfy local establishment. After we had our fill we pondered our next move. Upstairs at the convention center there sat two autograph stations and a room full of memorabilia. The memorabilia in this case was game-worn unis of former Orioles for super cheap. Even the pants. Seriously, the table said "Used Pants $15". The silent auction showcased some fine items including a 50th anniversary autograhed bat. The bat was signed by virtually every great Oriole in history and pulled in an easily over $500. All the proceeds from the auction were going to UNICEF's on-going Haiti campaign. Portions of the gate and concession sales also were going to Haiti moreover the Orioles were matching all money raised that day. With 12,000 fans in attendance I am sure that hundreds of thousands of dollars will be going to a fantastic cause. Matt, his brother Brian, Josh and myself decided to grab an autograph or two while we were near the station. The new autograph policy was either annoying or exciting depending on who you asked. No one knew who would be signing until one hour prior to that signing. So if you were looking for the four o'clock signing, they would be announced at three. Then you would have to be one of the first 250 to queue up and then the line would be closed. I liked the idea, in theory. I have been to autograph signings and waited in line for hours only to have the session end with me nowhere near the front. With this system, if you were in the line, you were getting an autograph no matter how long it took, which usually wasn't that bad. And because of that the atmosphere in the line was a bit more relaxed. Friends and family that were separated were allowed to move around, within reason, people could get out of line to go to the bathroom without fear of reprisal. My girlfriend Kate, saying she did not feel like spending two hours in line, trotted off somewhere else. But man did she get me. She got in the Matt Wieters line downstairs and was able to score me a nice, fresh, Matt Wieters ball. I am a lucky man I tell you what. My friends and I were treated to three young stars: Josh Bell, Jason Berken and Brad Bergesen. The one thing that struck me about all the players at fanfest was they all seemed just delighted to be there. Berken and Bergesen were joking around with the fans. Bell was genuinely trying to have conversations with people as he signed various balls and bats. On the subject of Bell for a second, when he does make his way to the Orioles he will definitely hold the record for most ink on the team. Bell is rocking the full sleeve. Most of the key players on the team were in attendance. Roberts, Jones and Markakis (who looks like he spent the winter in a cabin living off of "varmints") were their normal jovial selves at their forums. Guthrie and Berken challenged kids at Guitar Hero all day. Dave was nothing but smiles. It was a good day. At 5:00 the time came for the "Blogging the Birds" forum hosted by MASN's Steve Melewski.The last forum of the day was still well attended and it was a lot of fun. Frankly, being up there I was a bit nervous at first. But I settled in nicely and fielded questions like a pro. A huge thanks to the Orioles for allowing us to do that. The Orioles are not obligated in anyway to show us the kindness they did yesterday and last year. The day though can honestly be divided in half. There was the part before the announcement, and then after. 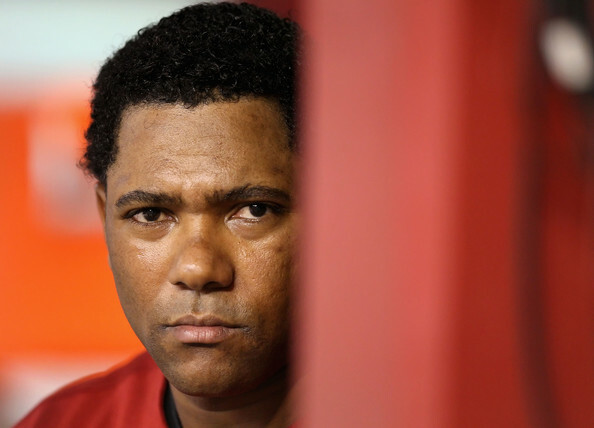 Right in the middle of the day it was leaked that the Orioles signed Miguel Tejada to a one-year deal. And the news rippled through the crowd. Honestly I saw nothing but faces light up at the sound of the news. All of the sudden fans seemed genuinely excited at the prospect of Tejada coming back. There doesn't seem to be much happening today at all with the Orioles, but Fan Fest is taking place this weekend at the Baltimore Convention Center. As always it should be interesting to see what comes of the event, the various personalities and seeing a crowd ready for baseball -- for better or worse with this team -- in the Spring. Over the weekend, the Orioles announced that they were raising the price of tickets bought on 'game-day', plus those of 'prime games' -- mainly those against the Yankees and Red Sox. Considering how bad the team has been over the past decade-plus, a lot of fans would not be happy about the price increases at all. During the past week, there's been a considerable amount of anger online on the various blogs and sites. Drew Forrester of WNST has been pretty vocal about his displeasure of the new ticket policies, but this morning, Kevin Cowherd of the Sun had his say about it and it's safe to say he's not pleased. Really, a lot fans are upset at the new policies not so much because an increase in ticket prices, but because of the performance of the Orioles on the field. As sad it is to say, there are kids around my brother's age -- he's 16 -- who will have almost zero recollection of a winning organization in Baltimore. Are most people seemingly upset about shelling out a couple of more bucks - no. The issue in a nutshell is that the Baltimore Orioles have sucked for years and why should fans feel compelled to pay for a lackluster product? For most people, I'd assume that they'd be willing to spend more if there was a marquee player signed this offseason on the roster such as a Matt Holiiday or a John Lackey. I don't want to disrespect anyone on the Orioles, but there isn't one. For a long time, the resounding notion amongst some in the area was that fans really don't care much about Orioles baseball anymore because of the losing for the past twelve years. Despite the dwindling attendance at Oriole Park for several years and the bashing of the organization -- deserved or not -- has received, fans do very much care about Baltimore baseball based on the turnout at today's Fan Fest. Although were in the dead of winter here, people were happy to see some reminder of baseball in the region along with the black and orange again. More than 12,000 fans showed up at the annual event this year. This time around, FanFest was held at the Baltimore Convention Center rather than at Camden Yards, and was held today rather than in April because the Orioles open the season at Tampa. It didn't make much sense to fly home to hold the event in April and then fly back to Florida. The Baltimore Sun's Peter Schmuck predicted that a player would be introduced to Baltimore this weekend in a blog post, and he was right on the money. Fans at the event found out through the word of mouth, texts, and emails that Miguel Tejada would be coming back on a one-year deal to Baltimore for a second tour of duty. Based on talking with other bloggers towards the end of the day, the reaction ranged from happiness such as "yes, the Orioles did well and it was a good signing", to indignation, plus the sounds of "why again -- he's old? ", plus, "we should bring the young guys up and let them have at-bats". In about two-and-half months, we'll see if Tejada can deliver and help the team improve, or if his signing was another in a long line of many with the Orioles over the current losing spell that will prove to be ill-advised. The million dollar is question is aside from Miguel being able to still produce -- which he probably will in one shape or another -- can he even play third? As well, the Orioles trotted out their new additions -- Mike Gonzalez, Kevin Millwood and Garrett Atkins. For fans, Saturday was fun as they got to see pretty much the entire team in one fashion or another with the various forums that took place on the main stage, during autograph sessions and demonstrations on a practice field. As well, team executives, the press, old-school Orioles participated in Q&A sessions with those in attendance, plus the were a multitude of vendors, memorabilia sales, and games set up for kids at the convention center. It was great to see the players relaxed and in street clothes for the event. Considering it is off-season, many of the players didn't feel the need to abide the team's grooming policy and quite a few really looked different than the norm. Two men in particular stood out -- Luke Scott and Nick Markakis. Aside from everything else listed above, the Orioles also included a select group of bloggers to participate during Fan Fest as well. My tag team partner James represented the blog, and the panel included Stacey Long from Camden Chat, Neal from the Loss Column, Chris from Baltimore Sports and Life, and last, but not least, Kate Wheeler along with Steve Melewski from MASN Sports (who was the moderator). The Baltimore Orioles should be given a credit for realizing that the online community can play a vital part in the dissemination of news, commentary and analysis. They extended their hand out to bloggers to be part of things, and I'm sure everyone who took the in the event was greatly appreciative. This year's Fan Fest surely did create a lot of buzz along with tons of excitement. With the New Year, fans seemed to forgive the past -- if only for Saturday -- and look toward the future. Whether or not it's bright or a glided one, we'll find out in October when the 2010 season ends. Morning all. Well, Fan Fest is upon us in a few hours and we'll do our best to update you as to what we see and hear throughout the day on Saturday. In the past, the blog has gone to the annual event with pad and pencil in hand to take notes on everything; however, this year, rather than update everything after Fan Fest is over, we're going to be ambitious and use the magic of Twitter to let you all know what's going on. As well, we'll try to upload pictures throughout the day for those of you who cannot attend to be informed in the best way possible. I'm also going to try to get sound bites from Fan Fest, but can't promise anything. Anyone in the greater Baltimore area tomorrow should roll on down to the Annual Orioles Fanfest at the Baltimore Convention Center. Season ticket holders will get in at 10:00 am for a special "State of the Orioles" address and Q+A session with Andy MacPhail and Dave Trembley. Doors open to the general public at 11 and the event goes on until six that evening. Vendors, forums, autographs, swag: Fanfest is always a good time. If you can't make it fear not, the Oriole Post will be there to bring you all the important coverage especially the morning forum with Dave and Andy. If you do stop by please hang out for the "Blogging the Birds" forum on the main stage at 5:00 pm featuring representatives from MASN.com, Baltimore Sports and Life, Camden Chat, the Loss Column and ME (!) representing the Oriole Post. Over the past week, Miguel Tejada's name has come up over and over with the Orioles, and now it he looks like he may be a potential viable candidate to suit up at third base. The Baltimore Sun's Jeff Zrebiec notes that the Orioles are now looking at Tejada, as well as Joe Crede -- the oft-injured third baseman. Right now, it seems the Orioles are looking to fill the third base hole, so Garrett Atkins -- who was acquired in December -- might play first base. Tejada, who had a productive season in 2009, is still on the market into late January. Reading a lot of the comments online, the opinions range greatly on a possible return for the one-time slugger. They range from outright indignation for Tejada being a steroid user, to his perceived lack of hustle and sometimes "me" attitude, to a lot not really caring about his percieved slights at all. He's not the player now that he was when he signed his big contract with Baltimore, but he's still got it at the plate. If you get a chance (you all probably have), read Roch's entry on Tejada, as it was interesting to hear his perspective on a potential move. Meanwhile, the Sun's Peter Schmuck would not be against him returning at all and is very complimentary towards Tejada. All things considered (once you look at the remaining free agents left at third), Tejada may not be a bad choice to fill in as a stop-gap measure until Josh Bell is ready to play in the majors. Last week, the blog sent some questions to Greg Bader - Director of Communications of the Baltimore Orioles - that centers more of the fan experience for the upcoming season. The topics touched upon in this Q&A include the teams's new Spring Training home in Sarasota, a little bit of what fans should expect at Camden Yards in April, and the new "day-of-game" ticket policy. What should fans who are heading to Florida expect to encounter in Sarasota -- the Orioles' new Spring Training Home for 2010. Can you tell us a little about the facilities at Ed Smith Stadium? How has the reception been so far with the team in town? As demonstrated by a very successful mid-November FanFest at Ed Smith and this weekend's potentially record-setting lines for spring training tickets, Sarasota residents and the business community have enthusiastically embraced the Orioles. To say we have been overwhelmed by the outpouring of support would be an understatement. I am told by many individuals who worked for the Reds that the enthusiasm being generated this year is like nothing seen before in Sarasota. I believe the residents know how close they came to losing Spring Training, which has been a fixture in this community uninterrupted since the mid-1920s. The deal with the Orioles, which represents a true year-round partnership between the club and the community, is one that folks in Sarasota know is a mutually beneficial relationship. 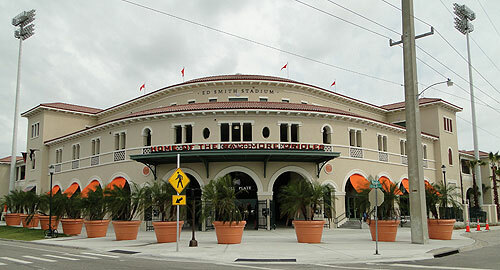 Ed Smith Stadium itself certainly represents an upgrade over the facilities we had in Fort Lauderdale. The ballpark is quite charming and will be undergoing some changes prior to the games in March, including painting and installation of Orioles logos, pennants and other historical elements. Like most Spring Training facilities, the layout of the complex affords the opportunity for a significant amount of interaction between players and fans--something that makes Spring Training so special. I am confident that fans who travel to Sarasota will be excited to find a welcoming environment both at the ballpark and around town. I know a few people in the Fort Lauderdale who were sad that the Orioles decided to move their Spring Training home across the state. Did the organization attempt to stay in the area or consider any other facilities in that part of the state? For many years, the Orioles worked with the City of Fort Lauderdale, Broward County and the State of Florida to reach a long-term agreement to keep the club in Fort Lauderdale. An agreement was reached between all parties, including funding sources, but unfortunately was derailed by the FAA (which owned the land where Fort Lauderdale Stadium stood and where the proposed new ballpark would be built). After many years of working towards and ultimately reaching a long-term agreement in Fort Lauderdale, this decision was obviously a disappointment to us and to our many fans in the area. Ultimately, however, we are extremely excited that Sarasota presented itself as an opportunity to become the long-term home of the Orioles. In addition, is the team looking to perhaps get some of those fans in that part of the state over to Sarasota to see the Orioles and perhaps keep them part of things? We have looked into partnering with a bus company to run a service from Fort Lauderdale to Sarasota; however, we have not found a cost-effective solution that fans in Fort Lauderdale would be willing to pay. That said, we have heard from many of our Fort Lauderdale ticket holders that they want tickets to select games in Sarasota and plan to come across the state several times each to see the games on their own. There's been some concern that the team has not done enough to keep some of the ex-Orioles as part of the organization. Recently, it looks as if the Orioles have taken steps to improve that situation by hiring ex-players to fill in spots at the minor league level. Is there anything planned on the major league level - PR wise, etc. - that fans will be able to see in Baltimore? The club has an extremely proud history and has always embraced bringing back former players to be honored and held ceremonies recognizing great teams of the past. Many former players have served as coaches, scouts and front office personnel. Last year we launched the Orioles Alumni Association which helped the club provide even more opportunities for former players to appear at Oriole Park. Our Alumni Autograph Series brought back a total of 40 former Orioles to meet and sign autographs for fans prior to each Monday and Thursday home game. We will have the same program this year as well. Additionally, as you know, this year represents the 40th Anniversary of the 1970 World Series Champs, so we will be honoring that team with a special Turn Back the Clock event (a date will be announced early next week). Expect to see nearly every member of the team back for a special reunion weekend. We are officially one month out from "pitchers and catchers" ladies and gentlemen! WOOOOOO, right? Woo? After making two fairly quick and well-received moves the Orioles have been largely dormant. Rumors put them in the Matt Holliday running, but logic dictated otherwise. The Orioles were legitimately in the Adam LaRoche running and according to Roch the Orioles offered the same money that he took from the D-backs, but he opted for Arizona. Fair enough I suppose, but I genuinely thought that he would be an Oriole. Aside from that there has not been a lot of action to talk about. On top of all of this the Orioles announced the "walk-up" surcharge which is pretty stupid but not something I am sharpening my pitchfork over. Most fans plan in advance to go to the game nowadays, but there is still a walk-up crowd of city-dwellers. They probably make up something like 3-7% of the crowd on a good day so the fees impact a relatively small portion of the fanbase - but that just so happens to be me this time. I guess that my girlfriend and other friends decided on a spur of the moment game at least 10-12 times last year. Will the extra buck stop us from doing that? Nah, don't see that happening but it is still a bit of a let down. The real bad thing about this price-change is that, with no other real Oriole news to talk about, it is the focus of the reporting and the negative nancies re coming out of the wood-works using this new policy as a launching pad to dredge up every slight, real or imagined, against them. That can be rather tedious. An interesting thread was started over at Orioles Hangout the other day. "Assuming the Orioles make no other moves...are you still excited [for the start of the season]?" Of course I am always excited for the start of any baseball season. Yesterday I was at the mall decked out in my Adam Jones orange shirt and '88 Orioles hat (the best looking hat ever made in baseball history) and a young lady making me a coffee asked me if I was a "big Oriole fan?" Now, I wear my Oriole swag so often that I don't think of them as "Orioles" shirts anymore, they are just part of my average rotation. My girlfriend chuckled as I began to awkwardly answer the question - fighting the urge to go into full level five fanboy mode. We were in public and decorum must be respected. Her older manager then began to regale us of stories of Memorial Stadium and the good'ol days. I went through that little diversion to better explain my answer - I am always excited about baseball, but I am VERY excited about this team. I can honestly say that I am as excited about this team as I was at the beginning of that glorious spring of '05. In fact more-so. The Orioles may not make another move before Spring Training, though I am sure they will, but that was never the point of 2010. Success in 2010 will not hinge on any of the potential acquisitions - it all rests on the shoulders of the Orioles' young players. The thoughts of Birdland this weekend are with Brooks Robinson as he is recovering from surgery. The news was first reported on Roch's blog yesterday and it goes without saying there was an outpouring of support towards the Oriole legend as well as one of the nicest men you'll ever meet. Orioles Hall of Famer Brooks Robinson was released from the hospital Friday after abdominal surgery on December 28. Not many people are aware that Brooks Robinson has been dealing with a serious health issue. I'm thrilled to report that he was released from the hospital late yesterday and is doing fine. Robinson and his family wanted to keep the matter private, which I certainly understand and respect. I'm just thankful that he's home again. "On December 28, 2009, I had abdominal surgery. The surgery was successful and I anticipate a full recovery. I have assured my wife Connie and my doctors that I will take it easy over the next few months. "I thank you for the outpouring of prayers, compassion and concern." "The surgery was successful and I anticipate a full recovery," Robinson, 72, said in a statement issued by spokesperson Diane Hock. "I have assured my wife Connie and my doctors that I will take it easy over the next few months. I thank you for the outpouring of prayers, compassion and concern." Hock said Robinson, who returned to his Baltimore home, considered the surgery routine, and that it is not related to the cancer issues he battled earlier this year. In May, Robinson acknowledged at an American Cancer Society luncheon that he had been treated for prostate cancer, undergoing 39 radiation treatments. In September, while at Camden Yards for a ceremony honoring Melvin Mora, Robinson said he was "feeling great." The Hall of Fame third baseman's most recent hospitalization was first reported by Masnsports.com. Now that we are pretty much a month-plus away from Spring Training (mainly, pitchers and catchers showing up). Although the Orioles have improved -- somehwat -- it looks like some of the fans are growing restless at the lack of moves that have taken place after the New Year. It's safe to assume that Andy MacPhail and members of his staff are obviously not making most of their thoughts public, we should give them the benefit of the doubt -- for now. We, as fans still have time before things kick off in Florida. However, there are a small group of fans still smarting that Adam LaRoche took a deal in Arizona and that the team has still not signed a 'slugger'. Of course, the Orioles probably need a huge bat considering they play in the AL East with the powerhouse Yankees, Red Sox and the competitive Rays. It definitely looks as if the Orioles -- much like other teams in the sport -- are just laying in the weeds and waiting for the chips to fall into place. Most teams don't announce their moves ahead of time, unless they deal with Scott Boras, and maybe the O's are still looking for their big bat. However, if Baltimore can't find their big bat, one must think Michael Aubrey will be perhaps a prominent part of the team. Based on Aubrey's stats and the amount he played last year, he certainly wouldn't embarrass the Orioles, but then again he's not Mark Teixiera either. All things considered, perhaps he should given a chance to be an everyday player. Seriously, if you look at the other men left on the board, all have issues -- most of the injury variety. Roch Kubatko reports that both Nolan Reimold and Felix Pie are slow to bounce back from their respective injuries; however, it remains to see if both will be ready for Florida. He also reports that the Orioles and Ben Sheetsmay not be a good fit, plus are still scouting Carlos Delgado. Pete Kerzel of Pressbox wonders if Andy MacPhail's moves will produce some more wins. Both Luke Scott and Jeremy Guthrie have filed for arbitration. The Orioles Fan Fest is on Saturday and there should be quite the contigent of current and former players at the Convention Center. In addition, tickets for Spring Training went on sale yesterday. Drew Forrester from WNST is smarting about the Orioles' new ticket policy. I don't blame him or anyone one bit. The Eutaw Street Holligans also have their say. The White Sox signed Daniel Cabrera to a minor league deal. Boy, has he fallen from where he was just a couple of years of ago. The Orioles have a ton of arms in their bullpen, and it should make for a decent competition out of camp. Spencer Fordin also has a mailbag on the MLB Orioles site. It looks like the Orioles are involved in some legal issues with their new home, but they'll be in Sarasota for the time being. Camden Chat takes a look at the refief pitching.. The Orioles Hangout takes a look at Andy MacPhail's trade history in atwo-part series. I can't imagine the change to purchasing tickets that the Baltimore Orioles will be all that popular that they are instituting next season. For the first time, the Orioles are charging a game-day ticketing fee of between $1 and $5, depending on the original price of the seat, for every home game this year - if that ticket is purchased after 12:01 a.m. on game day. In other words, walk up to the window to buy tickets on game day and you'll pay extra. The new policy, which will average an additional $2 per game-day-purchased ticket, is becoming more common in major league baseball, according toGreg Bader, the Orioles' director of communications. Last season, 10 teams did it; the Orioles have become the 11th and several more could implement it in 2010, Bader said. "In our mind, it accomplishes a couple of things. It rewards fans who buy in advance and make a commitment ahead of time to come to the park, and it has them make the commitment to come to the park," Bader said. In addition to the game-day fee, the Orioles have instituted another price change for 2010, increasing the cost of tickets for 19 premium games - Opening Day and the nine home games each against the New York Yankees and Boston Red Sox - by about 10 percent over last year's premium-game costs. Times are tough economically for businesses and perhaps the Orioles are just trying to open up another method to improve cash flow and revenue. Obviously, the team will make all the money they can off the prime games considering the amount it cost fans to see the Red Sox and Yankees at their home park. After seeing Adam LaRoche find himself in the Arizona desert thanks to the Diamondbacks, it looks like the Orioles are still trying to find their big bat; however, the names left on the board are't all that appealing. According to Roch's blog, the Orioles may be interested in attempting to sign Joe Crede, who recently played third base for Minnesota. Crede is a power bat and can slug the ball -- when healthy. Considering he's only played 234 games in the past three years because of injuries, the Orioles might want to save their money. He was a promising player at one time for the White Sox, but Crede could never stay on the field because of continous back issues. He might be fine as a stop-gap for a season, but I'd be very wary of him playing more than 100 plus games if signed. In addition, the Orioles are currently looking at Hank Blalock, who can too slug the ball, but is also trying to bounce back from injuries the past few seasons. Then again, most would put Crede or Blalock above Ty Wigginton, or any of the other options -- aside from Josh Bell -- in the system right now. Another name that keeps being thrown around is Miguel Tejada. I would be really surprised if he came back and put on a Baltimore uniform; however, I would not be surprised with anything that takes place in baseball anymore. I don't know how I'd feel if Miguel was just a stop-gap player and someone who could be flipped mid-season, but he's not even remotely the same player he was when an Oriole that he is now. Then again, he's still productive as an everyday player to a certain extent. Aside from being magically two years older now than he used to be, slower in the field, plus his power being all but sapped, his upside now is that he can still hit for average. The question is would Andy MacPhail be willing to welcome him back? Even though he's been gone from Baltimore for a little while, it's good to see Dominican baseball star Miguel Tejada doing his part to help those in Haiti. LaRoche Isn't Coming to Baltimore, After All.. I was really intrigued by the prospect of seeing Adam LaRoche sign in Baltimore; however, that does not seem to be happening now. It looks like LaRoche is heading out west and will be a member of the Diamondbacks. Sadly, the remaining first baseman left on the market really doesn't impress me much at all. I'm thinking LaRoche is taking the deal from Arizona to see if the market will pick up and see if there's yet another big pay day coming for him. As much as he would have fit in Baltimore with his power, he does strike out quite a bit and is a notoriously slow starter. From MLB Trade Rumors: The Diamondbacks signed first baseman Adam LaRoche to a one-year deal, according to Dejan Kovacevic of the Pittsburgh Post-Gazette. The D'Backs were not known to be interested or able to afford LaRoche, but the move makes sense as it allows them to use Conor Jackson in left field and give Brandon Allen more minor league seasoning. LaRoche reportedly turned down a two-year, $17.5MM deal from the Giants earlier this offseason, as he was aiming for three years. The 30-year-old hit .278/.357/.487 with 24 home runs in 610 plate appearances for the Pirates, Braves, and Red Sox. He earned $7.05MM in '09. He was a Type B free agent, but the Braves chose not to offer arbitration. I guess another name on the board the Orioles might consider is Russell Branyan. Yes, the first baseman did have a huge season in 2009 with the Mariners, however, he's in his mid-30's. Furthermore, there's not much in his past that would indicate that he's a good candidate to repeat what did for Seattle. If MacPhail does take a chance on Branayan, it should only be for one-year deal -- no more. Finally, it looks like lefty hurler Rich Hill is moving on from the Baltimore organization. He looked like he had some promise on the mound, but Hill was so inconsistent, and didn't seem have the ability to go more than five innings from start to start. Hill seemed to be a nice enough guy, but assuming he's healthy and doesn't have issues with his shoulder, the lefty should help someone. Even though most of us fans are a world away from the earthquake that took place in Haiti, thanks to technology via the internet, digital photography and other means, the imagery conveyed in the past two days makes what happened there much more real. There are no words that could be said of some the images that have been posted online. With part of the nation in complete devastation, people out in the streets with no where to go and projections of thousands dead, something needs to be done. If the damage to Haiti is even a small percentage of what I've seen on TV and in images, they are in for a very, very long road to recovery. If people have the time, energy, or money, take a minute a donate to the various charities who are assisting the victims of the Earthquake in Haiti. This blog criticizes the New York Yankees on a regular basis for their competitive advantage in the sport and for being rivals of the Orioles; however, once again in time of need, they've stepped up to the plate. On Wednesday, they donated $500,000 in support of rescue and relief efforts in Haiti. Needing More, Who's at First? I'll say this -- we all should be happy what the Orioles have done in terms of their acquistions so far, but the team does need more. While Andy MacPhail in late 2009 gave the roster a little face lift with the additions of Garrett Atkins, Mike Gonzalez and Kevin Millwood, the amount of activity from the Orioles has come to a halt. It's not to say that the organization isn't trying, but after seeing Matt Holliday sign for beacoup bucks with St. Louis, Adrian Beltre join the Red Sox, Jason Bay shacking up with the Mets, I'm sure a lot of fans are eagely awaiting the next move. At this point, most of the marquee names are off the market, therefore, who's even left to look at? While the pitching has been upgraded - somewhat - there's still something that may need to be done with first base. Obviously, most fans know that the Orioles still need a big bopper at first base in the lineup (Atkins has potential, but right now, who knows what will come of him). There's really not a free agent out there who doesn't come with some minuses in comparison to their positives, but the team could find someone for a decent price who could pay some huge dividends. Here are your first-baseman types available: Rich Aurilia, Russell Branyan, Hank Blalock, Carlos Delgado, Nomar Garciaparra, Ryan Garko, Jason Giambi, Aubrey Huff, Adam LaRoche, Kevin Millar, Fernando Tatis, Jim Thome, Chad Tracy and Dmitri Young. Looking the list above, the ones I have heard mentioned the most concerning the Orioles in media reports are Hank Blalock, Carlos Delgado, Ryan Garko and Adam LaRoche. From what I see, none of the guys are perennial All-Stars, and Delgado is past his prime; however, all could serve as an integral part of the lineup in Birdland. LaRoche would excite me the most as he's got a good mix of power and hits for average, although he is a slow starter, prone to striking out, and is average in the field. His stroke would be perfect for the right field wall at Camden Yards; however, it looks like he also wants a ton of money as he turned down a deal with the San Francisco Giants. He's still young enough at 30 to make an impact, but again, I don't think the Orioles need a player who seems to get lot later on. Another favorite of mine is Carlos Delgado. He's proven and has done a lot of damage into the later years of his career; however, he is coming off surgery on his hip and only played a scant amount of games last year. Carlos is also 38, but if he's healthy, capable of swinging a bat, and can prove it in the Caribbean Winter League, he'd be a steal and could be signed to a short term contract.